Pietro Paolini, Terraform, 2012, photograph mounted on board, 21 x 31". 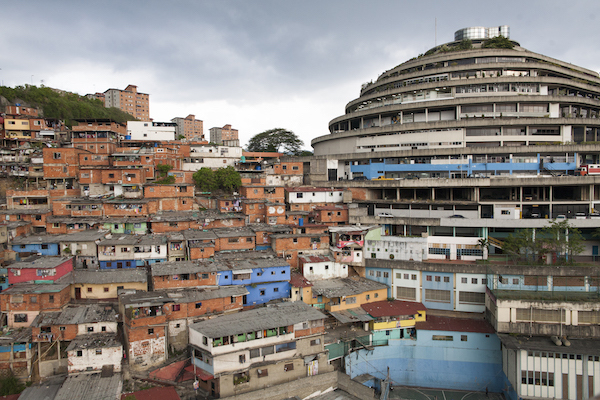 El Helicoide (The Helicoid) stands in the Caracas landscape layered like the world’s most extravagant cake. Conceived by architect Jorge Romero Gutiérrez in 1955, the reinforced-concrete edifice was supported by Marcos Pérez Jiménez’s military junta. Its double-helix ramps were slated to include over three hundred shops, offices, and a hotel, all topped by a geodesic dome. While a number of South American countries constructed massive modernist structures during pockets of socialist-leaning politics, this was not the case in Venezuela. This concise exhibition mainly illuminates the building’s conception. A vitrine of marketing paraphernalia and paper models shows how this piece of visionary architecture was used to aggrandize Venezuela’s image abroad. It embodies all the postwar values of speed, materialism, and national pride. One CMYK line drawing of El Helicoide shows the eight dizzying loops one must make in a car to climb the entire thing (Helicoide de la Roca Tarpeya [Helicoid of the Tarpeian Rock], ca. 1958–60). Other promotional materials show a day of shopping: illustrations of guests arriving in haute couture and stopping their cars in front of their favorite shops. Construction came to a halt in 1961, following the fall of the dictatorship in 1958, and banks disputed the building’s finances. The structure was only used as a shelter for landslide victims, in 1979, then since 1985 as police-intelligence headquarters. Only a handful of photographs present show El Helicoide today. Surrounded by a tawny shantytown, the settlements push against the concrete monster, a token of past promises and megalomania.